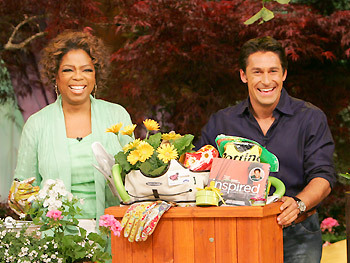 Jamie Durie has been back on Oprah this week in the US. He helped Oprah’s neighbours makeover their balconies. Obviously they aren’t much chop at being green thumbs in Chicago, they need “one of Australia’s biggest stars” to help them out. Say what? To make her neighbors’ balconies into miniature Edens, Oprah sends a call Down Under to get help from Jamie Durie—one of Australia’s biggest TV stars and one of the world’s most famous gardeners! Known for his ambush garden makeovers, Jamie has millions of fans, a book of his design influences titled Inspired, and he has even competed on Australia’s version of Dancing with the Stars. Jamie’s balcony designs even inspired these 12 condo owners to pay it forward to their other neighbors. “We all decided what we should do is have a balcony crawl so we can all experience the balconies and let other people in the building come into the units and see the balconies,” Russell says. There is also a video highlights section on the site. In Australia Durie is set to bring the show Australia’s Best Backyards to the Seven Network later this year.